Today there is a new member in our FamiLee. Fred and I have been discussing adopting another dog. 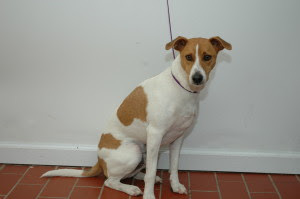 We were on Petfinder Tuesday "just looking" to see what animals were available and both of us were drawn to the photo of a Jack Russell mix at the SPCA in Queensbury. We drove up there on Tuesday but an hours worth of Aviation Mall traffic made us too late to get acquainted. We returned today, fell in love, and brought him home. Rascal is a great little dog. He is small. about 25 pounds but sturdily built, lively and affectionate. He already wears a deep scratch on his nose because Bubba didn't want to play. Rascal had quite the afternoon. He picked out his new person, Fred. He had a long car ride complete with a walk in Beman Park because Bonnie got called in to work on their way home. He has explored the house, chased the cats and now is curled up sleeping in Fred's lap-and he snores! Welcome to the FamiLee Rascal, it's a crazy life and we hope you will love it.